Ouch. That was definitely a humbling experience! 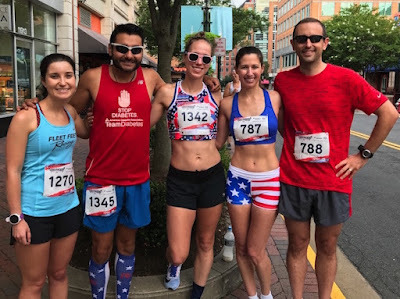 This morning I ran my 5th Firecracker 5K in Reston, VA. This race is always brutal with the heat, humidity, and hills. I missed running it last year because I had just come down with mono (or some mono-like virus), and this year I was thankful to be running it. I also missed this race in 2012 because of mono, and in 2013 because of injury, so the most important thing was that I was healthy enough to race. My time in 2014 was 22:54, and in 2015 I finished in 22:05. The timing of this race was not ideal. I flew to London last Wednesday for business, and then flew back on Friday. This definitely threw my body off schedule and resulted in a lack of sleep. However, I woke up on Saturday morning feeling refreshed, and I cranked out a set of 8 x 400m at 5K effort at paces that were faster than expected. I had been targeting 1:35-1:37 (6:20-6:28) and my splits averaged 1:33 (6:12). It felt like 5K effort and the fact that the temperature was in the low 70's and very humid was a sign that I was acclimated. As for goals, I wanted to run sub-20:30, and ideally beat my time from Lawyers Have Heart last month (20:24), which was a flatter course. I got another solid night of sleep on Saturday night, and felt great during the day, so I determined that jet lag would not be a factor in my race. I decided that I was really going to go for it. I am not racing again for another seven weeks, and after this race I have some scheduled recovery time built into my schedule. I decided that I would run the race based on effort (as opposed to pacing with my Garmin) and I wouldn't be afraid to go out hard. I was confident in my fitness and my ability to execute, so I was going to try and race this one really hard. Greg and I arrived 45 minutes prior to race start. We drank our UCAN and met up with a group of friends for a warmup. I felt pretty good during the warmup, but I could tell the humidity was pretty serious. It was 75 degrees, and I think the dew point was around 70. I was thankful for the mostly cloudy sky, and even decided I didn't need sunglasses. After a 2-mile warmup, Greg and I went back to our car. Just like we did for the Twilight Festival 4-miler, we brought a cooler of ice to the race. The plan was to soak ourselves with ice cold towels just before the race. 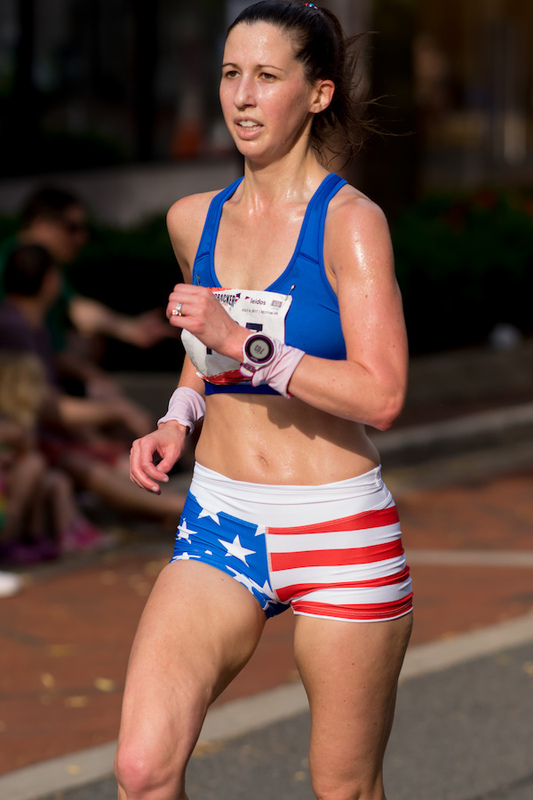 I threw a handful of ice into my sports bra, poured ice cold water over my head, and felt ready to race. We walked to the start line area, and I did a few strides. I've definitely improved my running economy and leg turnover during this training cycle, and the strides felt really fluid. Hannah, Perry and Me before the race. system not working properly. I waved to my dad and stepmother, who had come to cheer me on. Looking around the start line, I could tell this would be a very competitive race. It always is, and I had no expectation of breaking into the top 10 women. I lined up farther back than I typically do, considering how many elite athletes showed up and people who I knew were faster than me. This fast crowd pulled me out pretty quickly, and I told myself to have the confidence to run by feel. This mile has a rolling elevation, but it's net uphill. 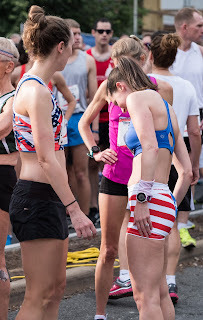 If I were being conservative, I would have probably paced it for a 6:35, but that wasn't my goal today-- I wanted to take a risk and see what would happen. It was pretty crowded the first mile, as it always is during this race. I was feeling pretty good as I polished off the mile in 6:27. A little fast, but I didn't judge it as I glanced down. Maybe today would be the day that I totally surprised myself and even PRed on a hot, hilly, humid course! While mile 1 and 3 are net uphill, mile 2 offers a nice long stretch of downhill. Whenever I have run this race in the past, my second mile has been the fastest. For the first half of the mile, I just cruised along down that hill at the same effort I had run the first mile. But about halfway through I hit a wall pretty hard. My legs felt good, but a wave of fatigue came over me and suddenly I lacked the energy to continue to push. I knew that if I didn't back off the effort a little bit, I would crash and never make it up that final hill. So I eased up ever so slightly so that I would have enough energy to surge during the last mile. Even still, I felt exhausted and tired and I wanted to quit so badly. When I clocked a 6:32 split, I knew that this was not going to be the day I had hoped for. Mile 2 was always much faster than mile 1. But I knew not to speculate and to simply focus on getting to the finish line as quickly as possible. Thankfully, I was able to devote all my mental energy to powering through the last mile. I think that the "former me" would have sulked about the mile 2 split and potentially given up mentally. Instead I simply thought "ok" and focused on my form as I powered up the first hill. I knew I had slowed down significantly, but I still had enough energy to push and run to my max. My split was 7:04, which shows that I had very little left to give. I wasn't surprised that when my watched beeped for three miles, I still had what seemed like forever to go. This course always measures long on everyone's Garmins, it's just something to expect. Even with the finish line in sight, all I could muster was a pace of 6:39. For the past six races I've run, they've all had a final kick at sub-6:00 pace. But not this one. I crossed the finish line, bent over with my hands on my knees, feeling like I might pass out. But I got over it quickly and was able to move on. My finish time on my watch was 21:16. Ouch. I haven't run a 5K that slow since my mono comeback in November. This is almost a full minute slower than the PR I set in May. I don't question my fitness-- I do think I'm in excellent 5K shape. But I definitely underestimated how much the humidity would impact my race, and that was a mistake. It just goes to show how much execution matters in a 5K. Fitness will only take you so far. I caught up with Greg, my friends and my family and we briefly exchanged race stories before going back to the car for more ice cold towels and ice cold water. We all cooled down together, and I struggled through that immensely. I felt completely gassed. This race took more out of me than any other race this season. Including the 4-miler in 81 degree temps. I looked to see if the results were posted anywhere but I couldn't find them. Greg found them just before the awards ceremony began and took a photo of them with my phone. My official time was 21:21, the same as my gun time. Crap! My chip must not have registered at the start line. The person who won 3rd place in my age group was just one second faster than me based on chip time, so I went over to the timing tent to get it sorted out. Sure enough, they told me that my chip didn't register at the start line. This is the second time this season that I've had this happen to me. This time, however, we couldn't use Greg's start time because I actually started two rows behind him. I showed them my watch and they changed my start time accordingly. This happened just in time for a race official to walk me over to the awards ceremony and present me with the 3rd place age group award. I do feel badly about coming in at the 11th hour and taking the age group award, but I did rightfully earn it and I couldn't find the results posted earlier in the morning. As I said earlier, this was a competitive field. The 10th place female ran a time of 19:06 and the winner ran 16:56. I was the 23rd female. There are two ways to look at this race. I could look at it as failed execution. I went out too fast, underestimating the humidity, and paid for it later in the race. If I had started out slower, I probably could have run an overall faster time. My execution in 2015 was much stronger, with splits of 6:57, 6:45, 7:10. Based on the course profile, I think this type of pacing is ideal. Or, I could look at it as taking a risk, and having it not pay off. I did take a risk because I wanted to test my limits and see what I was capable of. And the 5K is a good distance to test things, particularly when it's not "PR weather." So, now I know that if it's 75 degrees and really humid, I should go out slower. I also know that it's useful to look at the Garmin during the first mile to ensure that I don't get pulled out too fast. I've always thought this, but I figured I would take the opportunity to try not using it and see what would happen. I had a really fun time getting to see so many of my friends, and I feel like this was a good learning experience for me. It definitely was not the experience I hoped for, but I think it will help motivate me in future races. Even though the humidity hasn't seemed to affect my workout paces this season, a race is a different ballgame, and I need to respect that. And as I said earlier, I am thankful that I was healthy enough to run this race, as I've had to miss it multiple times in the past. I also fully realize that not every race can be a stellar performance, and I have had my share of strong performances this year. I have some scheduled down time this week and a very easy week next week with no hard workouts. I specifically requested this from my coach because I really don't want to overdo it in the heat and be burnt out before marathon training even starts. I'll begin marathon training the week of July 17th, with a target of the Indianapolis Monumental Marathon the first weekend in November. *hugs* I ran my worst 5K in a long time this morning. The sad thing was, it wasn't even an actual 5K- I was .2 short on my Garmin! And it was STILL my worst time in ages. The humidity can be brutal- especially 100% and July 4 seems to be the start of the real dog days of summer. It stinks that the chip didn't work and the time was off, and that the field was so competitive with awards (but at least competitive field, for me usually yields a faster time). If nothing else, you still got a tough run in, it builds you mentally. Good luck with resting and then marathon training! Thanks Amy! As always, a very helpful perspective. The humidity is a beast and I don't think you should beat yourself up too much over your results. And like you said, this race will motivate you for future races. There's always something to be learned from races, no matter how seasoned you are. I'm always amazed that no matter how well I plan for all the glitches, something unexpected pops up (like me needing to drink gatorade at mile 4 in a 10k--WTH?). You look so cute, BTW! This is all so true, particularly the learning part. There is always more to be learned. Thank you! First off, your outfit was on point. Love those shorts. As I mentioned in my IG comment, I think it was a good move to take a risk. You're obviously in great shape so why not - you never know unless you try. Congrats! Just not going to pr on a day like yesterday. Its about hanging on for dear life and trying to get within a minute of what you'd reasonably do on an optimal day. I felt really bad in mi 2 despite the downhill and keeping pace in check for mile 1. Still a fun race to do - had a real holiday feel and was big enough to be an event, small enough that it wasn't a complete hassle. Yes, absolutely agree on all points. Glad you had an enjoyable race. I love how festive it is! This time going to come out and say it upfront...way too hard on yourself in terms of this being one of your slowest 5k's! First, 21:16 is not necessarily a slow 5k by most mortal standards, especially accounting for course involves hills, and the high temps and humidity! Keep in mind that world elite men marathoners from Kenya, Ethiopia, and even some from US and other countries could probably run that 5k...even in heat and humidity simply running their typical marathon pace and finish first in entire field. Point being....speed is relative to intensity of the effort, or in other words...runners vary widely in their efficiency/economy of running. But no matter where anyone places in terms of FT, if they were running at sub-maximal and maximal effort in 2nd half of race, then they running at their physical maximum and the time to do it is simply the end byproduct. So in many respects....way too much emphasis on the FT not being faster than prior 5ks, and way too focused on the mile split pace. Your description hunched over with hands on knees post-finish says it all...you ran hard and probably at your maximal effort in the latter half...probably explains why you had little or no "sprint-kick" in the final metric finish from 3-mi mark. HR intensity data would be the best surrogate measure of your effort, but I don't recall ever seeing you track or use that metric. Something I recommend you start in the future. All in all...from what I read in your recap...indicates to me you ran a really good race in terms of mental toughness and intensity relative to the course terrain and temp and humidity conditions. You say you were taking "a risk" running by feel, but you raced it perfectly fine by feel and flow, so consider that 21:16 a successful race! 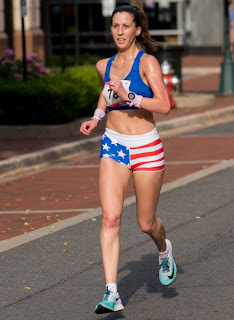 BTW....the patriotic theme in race apparel quite awesome! I in fact ran a 5k on the 4th and there was a gal with that same design...only she ran inf full tights...and with moderately high temps in upper 70's and high humidity! So I don't look at that you took a risk and came up with a "slow" time." From what I see in your writing...you ran a race according to the awesome Arthur Ashe quote; "Start where you are, use what you have, do what you can"....so consider it a great race and be happy with the FT! Hey, the conditions were tough! I felt the pain in that race too. It was still fun to see you and w/u & c/d together.